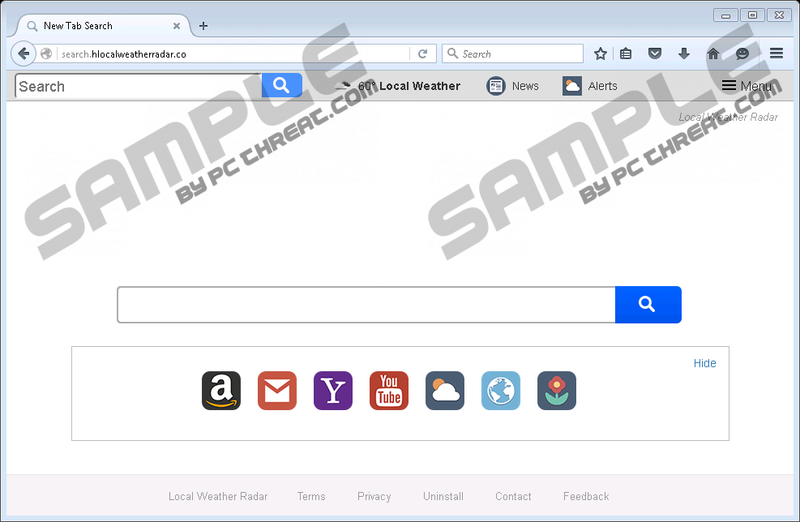 Search.hlocalweatherradar.co is one more browser hijacker that currently roams the web. It is critical to avoid it at all costs since it exhibits extremely invasive functionality. If you happen to already have this devious program running on your personal computer, make sure to remove it as soon as possible. That is paramount because due to the overall functionality of this hijacker, surfing the web the way you like it will be an impossible task. It is mostly because this program is capable of making intrusive and unwanted changes to major web browsers such as Internet Explorer, Mozilla Firefox, and Google Chrome. What makes matters worse is the fact this hijacker could prove to be a major virtual threat. If you wish to know more about the intricate functionality of this invasive program, make sure to read the entire report. Besides that, we also present a detailed removal guide for Search.hlocalweatherradar.co that you must use to get rid of it once and for all. Search.hlocalweatherradar.co functions in a quick and silent manner. Right after it gains full access to your operating system, it starts making intrusive changes within your web browsers default settings. It modifies files and registry entries linked to settings of major browsers without any warning or authorization. Due to such intrusive modifications, you will notice a sudden change of your default homepage. Some users might think that it is not that big of a deal. The reality is quite different. As time goes, you will realize what a negative impact such unauthorized change can have on the way you experience the web on a daily basis. That is so because you will have no choice but to use a questionable third-party website as your default homepage for as long as this hijacker will be up and fully running on your operating system. What makes matters worse is the fact that the newly appointed homepage does not provide any valuable features. It provides a list of quick access links; unfortunately, you cannot customize any of them. Also, there is a whether tab, which does not provide reliable information at all times. As you can imagine surfing the web the way you are used to will be virtually impossible to this single intrusive change within your browser. The only way that you can restore your web browser's default settings is by executing a complete removal of Search.hlocalweatherradar.co. To do that without encountering any major problems, use the instructions that we provide below. During further analysis of our malware experts have discovered that there is more to Search.hlocalweatherradar.co than meets the eye. While the intrusive functionality of this browser hijacker should be a reason enough to delete it without any hesitation, you must also know that it could prove to be quite dangerous. That is so because using the search field on a newly appointed homepage could have devastating outcomes. As it turns out you could come across results that might host devious redirect links. What this means is that clicking on a seemingly harmless result your risk entering a devious third-party site. Thus, your operating system could be exposed to the questionable and otherwise dangerous content. You might find yourself on a fake online shop created by cyber crooks to steal your credit card data. In other situations, you might end up on a web page that provides malicious software for download. As you can imagine, entering any of the mentioned websites could have devastating outcomes. If you are a security conscious user, make sure to delete Search.hlocalweatherradar.co in its entirety at the very same moment that it is found up and fully running on your personal computer. The complete removal of Search.hlocalweatherradar.co should be your utmost priority if it is ever found running on your personal computer. You need to execute the instructions that we provide below with precision since a single mistake could have undesirable outcomes. That is so because leftovers of Search.hlocalweatherradar.co could turn out to be quite invasive as well. In certain instances, they might be enough to restore the hijacker in question without your knowledge. There is also a possibility that just a few traces could turn out to be more than enough for the devious changes to remain in place. If you want to avoid finding yourself in such a situation and be sure that every single bit of Search.hlocalweatherradar.co has been removed from your operating system, you need to execute an in-depth analysis of your entire operating system for anything associated with it as soon as you are done with the instructions below. Delete files entitled Preferences, Secure Preferences, and Web Data. Quick & tested solution for Search.hlocalweatherradar.co removal. Does not seem to apply to Chrome.